MySQL only has one operator that allows you to work with regular expressions. This is the REGEXP operator, which works just like the LIKE operator, except that instead of using the _ and % wildcards, it uses a POSIX Extended Regular Expression (ERE). Despite the "extended" in the name of the standard, the POSIX ERE flavor is a fairly basic regex flavor by modern standards. Still, it makes the REGEXP operator far more powerful and flexible than the simple LIKE operator. If you copied a regex written for another programming language or database, simply paste it into RegexBuddy, select the original application, and then convert the regex to MySQL. 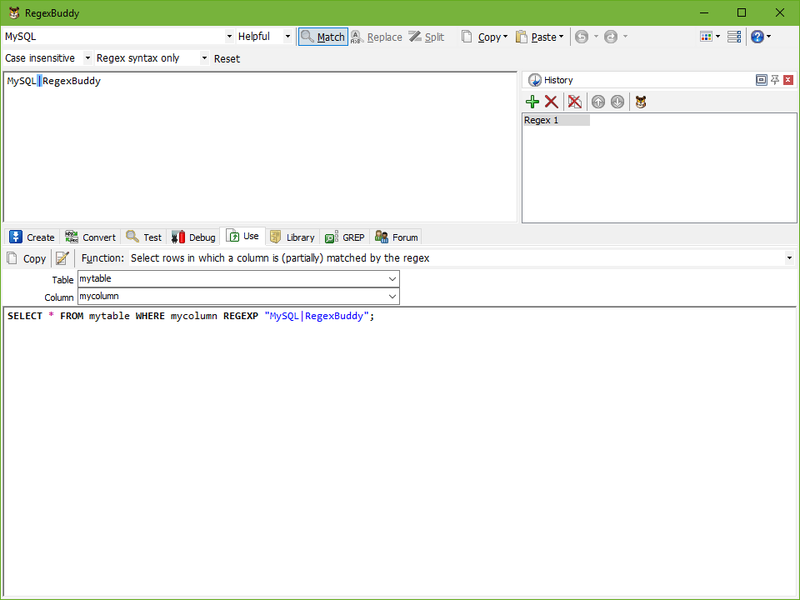 If you created a new regular expression, test and debug it in RegexBuddy before using it in your MySQL queries. Test each regex in RegexBuddy's safe sandbox without risking precious data. Quickly apply the regex to a wide variety of input and sample data, without having to produce that input through your database. Don't bother trying to remember MySQL's specific regexp syntax. And don't worry about properly escaping backslashes and other characters. Just tell RegexBuddy what you want to do, and you will get the proper MySQL code straight away.